You know, some people have twins … that would be much harder. Take some deep breathes, nap time is in less than an hour. Jesus is on your side even if Jemma isn’t. You don’t just love your kids, you like them too. Right? Nursing bras are even hotter. Really. Dominic will be home soon. Dear Lord, please make him get home early today. See what I mean? An adventure. I alternate between feeling extremely grateful and extremely overwhelmed. I’ve always wanted to be a mom. Even more, I’ve always wanted to be at home full-time with my little ones. But, boy, this mom gig is hard some days. Most days. There are times where everyone is crying and on the verge of mega meltdown – including me. Then, we all recover and have laughs and snuggles that warm me from the outside in. I’m adoring the growing relationship between Jemma and Max. Jemma has slowly been warming up to her little brother. I think she has finally connected that he is here to stay. She loves to rock him in his swing and is quick to locate a pacifier (bee) whenever he cries. On a few occasions she has settled on the couch and motioned for me to set Max in her lap. Once in place she’ll pet his hair, rub his cheeks, and give him little kisses. Yes, I die over the sweetness. every. single. time. On the flip side, Jemma knows when it is her turn for attention. The other day I was swaying with Max and she marched us over to his swing and demanded that he be put down so she could climb into my arms. My girl is a smart one! She knows exactly what she wants! My days begin early and end late. Jemma is up anywhere between 6-7am. Max doesn’t completely settle until 10 or 11 pm. Thankfully, Dominic spends the first hour with Jem as he gets ready. By the time he leaves for work, Jem is cozy on the couch with her first round of breakfast and a Sprout show or her favorite baby signing movie. Until 9 or so, I alternate between snuggling Jem and nursing Max in bed. Interesting things happen when I’m around the corner nursing Max in our room. Jem brings me all sorts of treasures she finds – my glasses, handfuls of nursing pads, stuffed animals, and DVDs out of the case spinning on her finger. Oh Lordy. Recently she unpacked her box of 500 mini hair ties and sprinkled them all over the living room. Eek! She has also come running to find me shouting “Uh-oh, it’s poo!” as poo literally ran down her leg and on to the carpet. We’re in the midst of a little colon cleanse to clear out her system/alleviate her poo fear/relieve constipation before we begin potty learning. Most days I feel homebound because we never know when the poo will come bubbling out. These are the realities of motherhood that no one tells you about. The mornings are anything but calm! If it was just Max and I we would be in bed until 9 or 10am. He loves sleeping in! Of course, I don’t wish that, I just wish I could get a few more zzzz’s. But, what mom doesn’t wish that? Total side note. I’ve been trying my darndest to cut back on dairy. Over a year ago our naturopath ran blood work on Jem and I to test for food intolerances. Jem is intolerant to potato (which is in everything) and I’m intolerant to dairy, my one true love after Dominic. In an attempt to have more energy and heal my gut I’m slowly cutting out dairy by eliminating cereal from my morning routine. Gotta start small on this one. This means I whip up hot breakfasts every single morning. Pancakes have become my number one obsession since Max was born. So yummy! After my first breakfast and Jemma’s second round we attempt to get ready for the day. This happens most days, but not always. Sometimes we are still in jammies when Daddy gets home. ‘Tis the life of your children not caring about your daily appearance. I really appreciate a hot shower every day even if it doesn’t happen until noon. I usually take one even if it results in Jem and Max both wailing outside the curtain. Sometimes a mamas gotta take 5 minutes for herself, know what I mean? Laying in a puddle of milk all night makes me sticky and that is just no good for my self esteem. Oh, the woes of cosleeping. Plus, who likes to wear clothes that have become stiff from dried breastmilk? Not I said the Gretchen, not I.
Jem and I warm up lunch around noon and she settles in for her afternoon nap around 12:30 or 1. Enter bliss. Well, only if Max decides to conk out at the same time … which is getting more frequent. Thankfully. Somedays I set up the monitor (to listen for Jem) and snuggle in next to Max for my own nap. Other days I catch up on housework, prep dinner, blog, sort and respond to emails, etc. You know, everything in my life that doesn’t intimately involve children. Nap time feels like a ticking time bomb though since Jem will sleep somewhere from 1 1/2 to 3 hours depending on her mood. I haven’t quite figured out what gets me those longer naps, but I’m still trying! After naps we usually bundle up and take a stroll to the mailbox. I wear Max in the Baby K’Tan and push Jem in her stroller or trike. Well, except for the days she demands to be carried. Then I find myself pushing mail and carrying 45 pounds of children. I’m sure I’m a real treat for the neighbors. Because really, who doesn’t like to see a yoga pant wearing mother pushing a stroller full of mail while wearing an infant and carrying a toddler who looks like she is three? Jemma is in love with being “ou-sigh”. When we pull into the backyard from our mail trip she hops into her little car or heads towards the slide. This usually entails me having to dry everything off with a towel thanks to the wet PNW weather that has hit. It’s going to be a long winter inside! Some Most days I really want a break. Just 30 minutes to myself. Really an hour would be swell, but I’d take 30 minutes. Shoot, I’d take 10! A time when I’m not on-call. I’ll admit, I’m getting worn out of this round the clock adventure. My Mom and Dominic arrive home between 5-6 pm. Jem is ecstatic at their arrival shrieking “MIMI!” and “DADDY!” as she races into their arms and talks a mile a minute about her day. Jemma plays with her favorite person in the world – Daddy – while I rush around doing my two-handed activities as Max grins and babbles with his Mimi. We eat dinner and I talk to adults. It’s awesome. Jemma heads to bed at 8 pm and Max and I power through his fussy time. He settles in to nurse between 10-11 pm and I take an hour or two for myself. Yes, I should be sleeping. Dominic and I are watching Survivor, Shark Tank, and Grey’s this fall and I’m loving my Private Practice and the new show, Revolution. If you ever watched Jericho – the best show ever – you’ll love Revolution! Dom says it won’t last because all my favorite shows get cancelled before a second season :( Remember Lipstick Jungle, Cashmere Mafia, and Off the Map. I loved those too. Oh my gosh!! Jericho is totally our favorite show and when I was trying to sell Ricky on watching revolution with me I told him it was like Jericho fast forwarded :) love it! Hang in there, Em turned two 12 days before Eli was born, we made it :) i always tell new moms to take a shower even if the baby screams. It just makes you feel human again. Hunter went through a ridiculous diarrhea stage last November. It lasted almost three weeks. We think it was a reaction to eating cherries for the first time. Just like you, we had to plan our outings based on the last time he went poo. He would stop, look at us, and then start whimpering as the poo ran down his leg. So not fun!!! Totally feel you on this whole post, even though Hunter is 2.5 yrs old. In the moments when everything works, it's bliss. In the moments when everything falls apart, Jesus help us! I enjoyed reading this post, just because I can relate to so much of it right now. I have to give dairy up for a few weeks to see if it helps with my little guy's congestion. I am finding it is pretty hard… there is dairy in a lot more than I thought. Do you have any tips? How did you adjust your eating to get the nourishment you still needed? Great post. I'm glad there's a whole heap of joyful with the challenging. You're doing a great job and have aleviated some of my mama of two fears. I literally feel like I just read a recap of my own current existence. 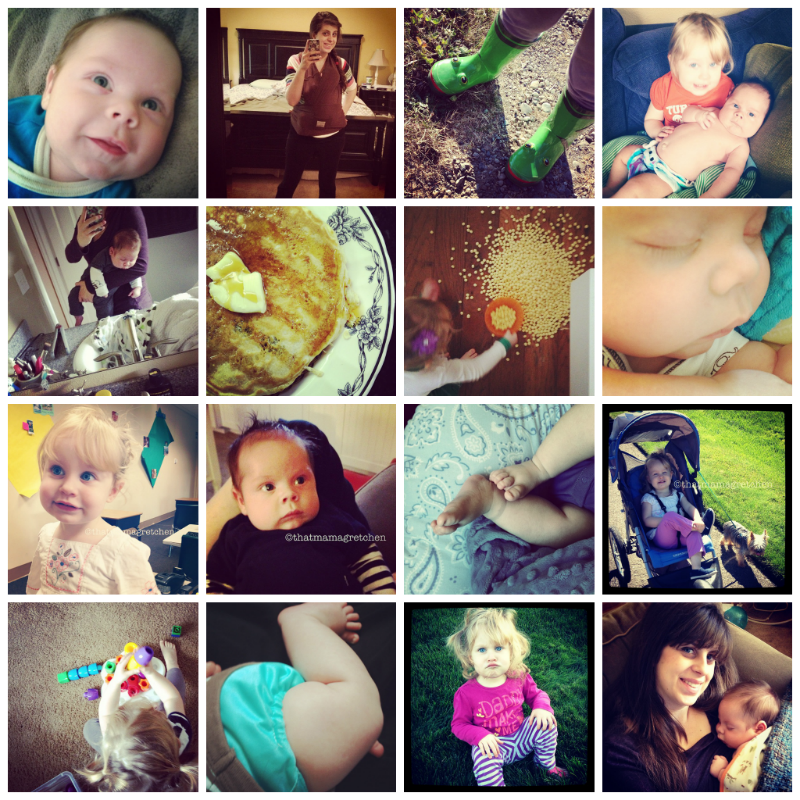 A constant dance (or clumsy tripping around) of babies, babies, and more babies. What you just described is exactly what my life is like. You are not alone! It is so hard, but it is so good. Every season brings it's own difficulties, but each one reaps such a reward. It is super hard! So far, I've only cut out straight up milk. My midwife said cultured things like cottage cheese and yogurt aren't as hard on your gut. I wish I could offer more advice. I have searched "dairy-free" on Pinterest and have found some good recipes to start incorporating into our meals. I hear ya! These ages are just plain hard. They are rewarding too though. I can't wait until they are a touch older and play together more – then my heart will seriously start melting! Interesting! I hadn't heard that. Thanks so much for sharing! Less hard than I thought it would be. I had a few full blown panic attacks while pregnant :) Levi is such a different baby than the other two; he is still eating every two hours around the clock so my exhaustion this time around is reaching epic heights. Em and Eli slept good 5 or 6 hour stretches at this point. God definitely knew best when he had us wait 8 months to get pregnant this time around! Having the 3 1/2 year gap between the boys is so much easier and I don't think I would have survived with a newborn and Eli just turning three. All that to say: it's hard on the sleep/ultra needy baby front, but having the older two be mostly self sufficient and pretty good at entertaining themselves when I need them to has made it okay to let Levi be Levi :) I think I'm way more grounded in the whole baby thing this time around too. A lot more patience, much more acceptance over the tough parts. Perhaps my age? Or just a different perspective. It's true, wouldn't change a thing! I'm so blessed to have you a few steps ahead of me … Thanks for always being such an encouragement! Every two hours is hard! Jem was like that, Max is having some longer stretches though. I'm definitely thinking we will wait at least 3 years before #3. Glad you have a good perspective on things – staying positive makes all the difference!